The Acropolis of Athens with all its monuments such as the Parthenon, the Propylaia, the Erechtheion, the Agrippa monument and the Nike Temple. Meet with your food and archaeology expert licensed private guide and start your fascinating day of discovery with a visit of Dionysus Theater, the oldest theater in Greece. Continue your walk up on the Acropolis hill while enjoying breathtaking views of the nearby monuments, such as Herodes Atticus odeon, Philopappos Monument, the Observatory and others. Enjoy a full explanation of Acropolis’ marvellous monuments: the Temple of Athena Nike, the Propylaea gateway, the Erechtheion and the astonishing Parthenon. Your knowledgeable guide will provide you with plenty of information and uncover fascinating facts about the construction and history of the monuments. The unique, beautiful view of the city of Athens, including the Mars hill, the Ancient Agora and the Temple of Hephaestus, will capture your heart and mind, same as you will capture them on camera. After conclusion of the Acropolis visit, continue your walk crossing the beautiful old town of Athens, the Plaka. Stroll the Monastiraki area and start a delicious journey of discovery through the streets of a less known part of Athens; the Athenian Market area. You will discover a kaleidoscope of colors, smells, tastes and textures. You will be led past producer stalls bursting with color, intoxicating spice shops, enticing sweet shops, bakeries and of course the bustling central food market of Athens. 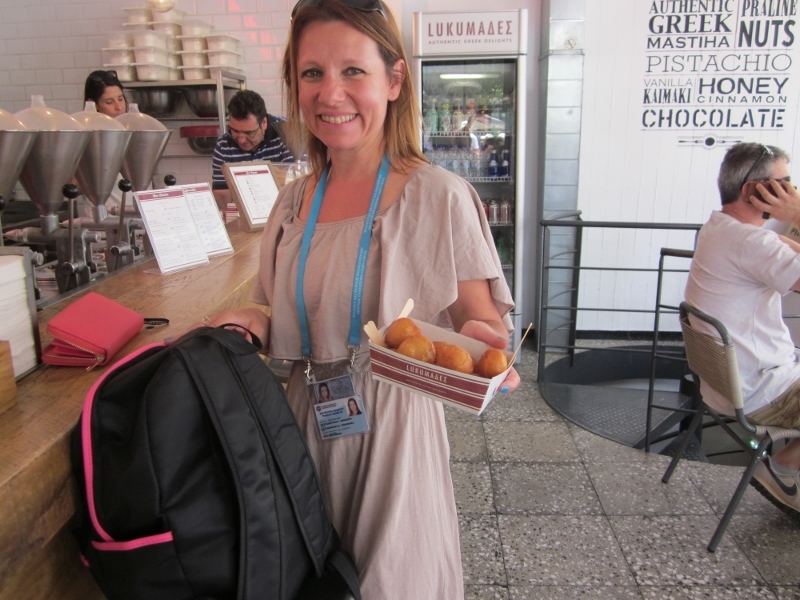 Visit small, hidden, specialty food shops where you will have the opportunity to free sample a wide variety of Greek delicacies ranging from mouth-watering sweets to original traditional Greek products, such as olives, honey, cheese a.o. Your knowledgeable guide will also provide you with valuable insight both on the unique and intricate culinary heritage of Greece as well as the famous Mediterranean diet, hailed today as a model of healthy living. Your tour will be concluded near the Monastiraki area. Our recommendation is: the "FRESKO" Yogurt Bar located on 3, Dionyssiou Areopagitou st. and Syngrou ave. It is at the beginning of the pedestrian walkway that takes you from Hadrian's Arch to the Acropolis. This is a very convenient meeting point considering the sights you are going to visit. Your tour guide will be holding the orange colored Athens Walking Tours sign to identify them. We buy the tickets for you in advance, in order not to line up. Please make sure that you have enough cash (euros) with you to purchase the tickets. 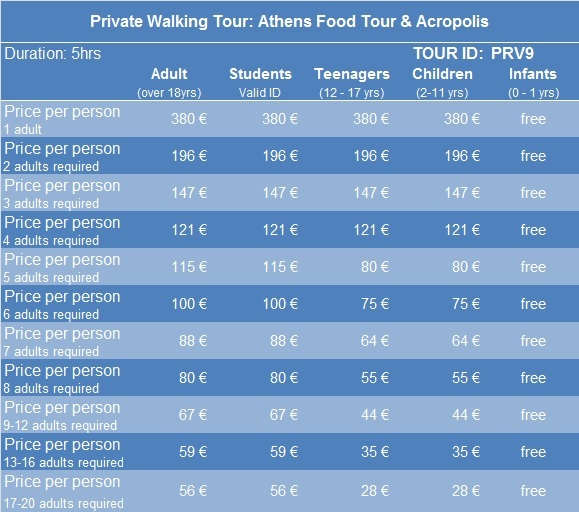 Admission fees for all places we visit during the Just the Acropolis Tour (Parthenon, Nike temple, Propylea, Erechtheion and Dionysus Theatre) are not included in the tour's price. Journalists are entitled to free entrance to the Acropolis by presenting their current identification card. During winter (November 1 to March 31) the latest starting time for tours will be 11:30 am due to earlier closing hours of the archaeological sites and museums.